As predicted, Vivo showcased fingerprint sensor technology embedded in a smartphone screen on Wednesday at the Mobile World Congress 2017 in Shanghai. The 'Under Display Fingerprint Scanning Solution' is based on Qualcomm technology and was demonstrated running on prototype devices based on the existing Vivo Xplay 6 phone. Vivo claimed the under-display fingerprint solution, which doesn't require a physical button for the sensor, is "the first to be demonstrated by a smartphone manufacturer". The technology enables the use of a "true full-screen display and an integrated unibody and mechanical waterproofing design", said the company. "In Vivo's R&D plan, fingerprint scanning will not be carried out by an independent button or region. It will be realised more subtly under the screen, behind the metal shell, or even in the frame. "Based on ultrasonic technology, the fingerprint recognition technology can be further expanded to realize user interaction, such as gesture recognition, security verification and other fields, which will greatly enhance user experience." Vivo told Engadget that while the fingerprint scanning function was limited to a small region on the prototype devices, in theory the same sensing technology could be applied across the entire screen, but that it would significantly increase production cost. 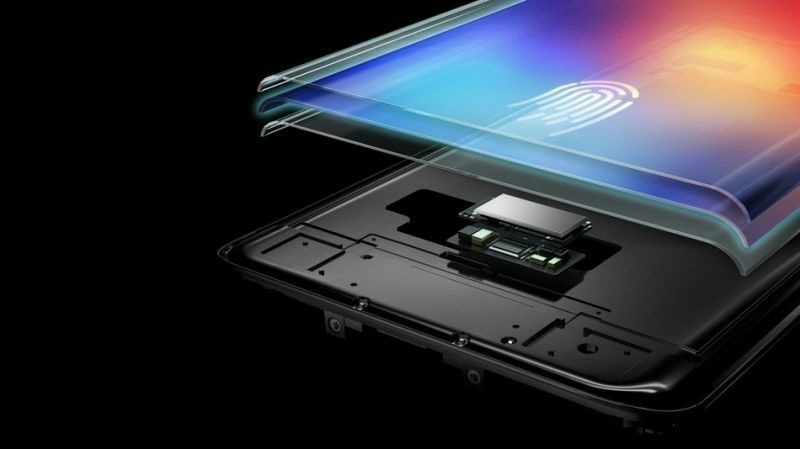 Following the unveiling, Qualcomm issued a press release announcing the development of new fingerprint scanners that work through displays, thick glass, and metal, with underwater operation, heartbeat and blood flow detection. "We are excited to announce Qualcomm Fingerprint Sensors because they can be designed to support sleeker, cutting-edge form factors, unique mobile authentication experiences, and enhanced security authentication," said Seshu Madhavapeddy, vice president, product management, Qualcomm Technologies, Inc. "This provides OEMs and operators with the ability to offer truly distinct, differentiated devices with added value on truly groundbreaking new devices." Qualcomm claimed the technology was capable of scanning through OLED display stacks "of up to 1200um", and was the first commercially announced to scan through up to 800 µm of cover glass and up to 650 µm of aluminum, an improvement over the previous generation's 400 µm capability for glass or metal. The company said it had designed the technology as an integrated solution with Qualcomm Snapdragon mobile platforms, and as standalone sensors that can be used with other non-Snapdragon platforms. Qualcomm said the fingerprint sensors for glass and metal will be available to OEMs this month and should arrive in commercial devices in the first half of 2018. The sensors for displays are expected to be available to OEMs for evaluation in the fourth quarter of 2017. Apple's upcoming "iPhone 8" is rumored to include a fingerprint-sensing display, but the company has reportedly faced significant challenges in its efforts to develop the technology for its radically redesigned flagship device, due to release in the fall. Apple is currently in a major legal battle with Qualcomm over its LTE modems, so it seems unlikely the company would consider offering its technology for inclusion in future iPhones. However, the announcement at least demonstrates that the technology is viable, which lends further credence to reports that Apple has perfected its own screen-embedded fingerprint recognition solution. The technology will give Apple's OLED iPhone a significant advantage over its biggest rival, Samsung, which is expected to stick with a rear fingerprint scanner for this year's Galaxy Note 8. Apple is expected to unveil the iPhone 8 and more traditional "iPhone 7s" and "iPhone 7s Plus" models around the usual September timeframe for iPhone updates, although rumors have suggested supplies of the more expensive OLED handset could be tight for up to several months after the official debut. It seems rather convenient "unveiling" it now with the disclaimer "it's just a prototype", with the new iPhone (and possibly other Android flagships) coming up later this year. If you have the technology, manufacture and sell it. I'm sick of OEM's vaporware. Are some of those icons lifted from iOS in these mockups, or are they actually that slavishly copied in this version of Android? So this is for OEM this month? What are these OEM? Vivo when will come out? The device is just a mockup and from the looks, it's designed to capture some virality from iPhone 8 rumours! Hoping to get mixed up and promoted through that. Stealing the icons is another step to faking iPhone 8 virality. It was certainly done on purpose! "Qualcomm Fingerprint Sensors for Glass and Metal are expected to be available to OEMs this month, and are expected to arrive in commercial devices in the first half of 2018. "Qualcomm Fingerprint Sensor for Display is expected to be available for OEMs to evaluate in the fourth quarter of 2017." This is brilliant news, no pressure Apple. I think This is a Strong Sign that iPhone 8 will have touch id embedded in the display.Thanks No Rear FPS. So Apple is doomed because a Chinese OEM showed off a prototype? Hope, the whole screen will be a one, big fingerprint sensor! Any other case (a small square behind the screen) is a sh-i-||y experience (as it is at the moment with current iPhones). Right now is a bad experience? Compared to what? TouchID as currently implemented is one of the biggest technological use facing improvements I have seen in the iphones. Maybe the biggest. Hiding it behind a screen sounds amazinger. There is a difference "in first to announce" vs "first to conceptualize". And the biggest difference is first to ship with it done right. Maybe vivo will win all those, maybe not.